this beautiful little chap is the reason for my love of grey squirrels being a shameful don't-tell-the-warden one. Greys were once thought to be incapable of thriving up here in the North East, but oh, they are proving everyone so wrong, and we are supposed to regard them as worse than vermin. 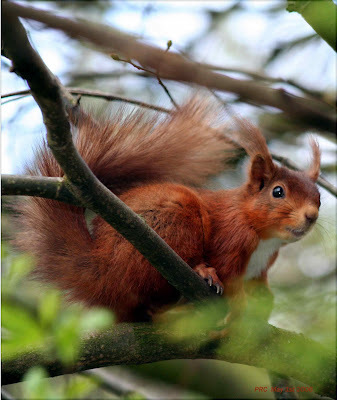 Faced with a cheeky plump grey squirrel, I find it hard to think evil thoughts about it....For more info, have a look at this from the Red Squirrel Protection Partnership. The Lovely Son sent me this today; note the neighbour's cat in the background? Well, there's another cat (the plumptious Tabby Princess, who is scared of squirrels) sitting next to the Lovely Son, safely behind glass, as he took this photograph. 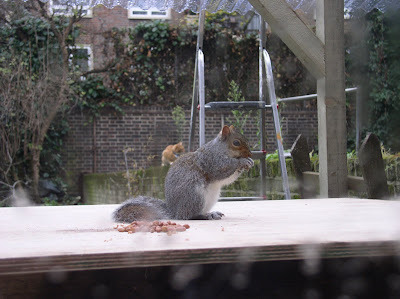 Grey squirrels are getting closer here too; one was spotted within a stone's throw of Bacteria Gardens the other day. I hope they will be bold enough to raid my bird feeder, because heaven knows the birds don't. But today the clouds lifted a little and I had a flurry of determined activity, freecycling things that had stood unused for ever (wow, half of Newcastle wanted my elderly Kenwood Chef!) and passing on a spare tv to Margery. 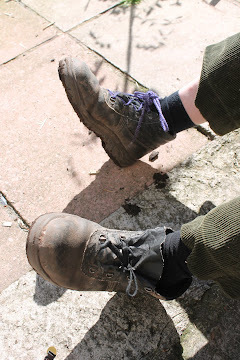 I feel a lot better now, and I think that this may hold a clue - I complain frequently about being oppressed by my belongings, as numerous as when I was part of a family, and as they started to thin out, albeit imperceptibly at this stage, I started to feel lighter and more energetic. And I had a good think about Christmas, and the frenzy of presents and card-sending that usually gets out of control; it doesn't seem right, somehow, to spend and splurge this year, so restraint and frugality is the aim. Whether I'm capable of it is another matter, but I shall try; the problem is, that for me frugality equates with lentils and making do, and I rather enjoy the righteous feeling that one gets from eating up leftovers and going round the supermarket with a hand basket instead of a trolley. When it comes to other people, it's more complicated. I'm not confident that I can rustle up a guilt-free yet tasteful range of presents for my nearest and dearest that doesn't scream penny-pinching at them. I hate making Christmas cake, as it all feels too early for my liking, but it's done now. This will look better once it's been marzipanned and iced, but that won't happen for a while yet. Meantime, the cake (not the baker) will be fed spoonfuls of brandy on a regular basis. Another life stage has been reached, one that is little-heralded, but deeply significant. I have just made my application for the State pension. I am to become a pensioner. I was prompted by a call from a diffident young man from the Tax Office, who asked if I knew what my pension would be, presumably so that I could be cruelly taxed on it. Apparently I could apply two months in advance of my 60th birthday, which falls just before Christmas, and it seemed to surprise him that I hadn't raced to do so last month. He would, of course, be unaware of how remembering to do so at the right time would be a task beyond my chaotic memory; he wouldn't have known how often I'm unsure of what day of the week it is, sometimes resulting in friends' cats being fed a day early, when their owners are still at home and somewhat surprised to see me. Recognising a two-month marker would be impossible unless it was written on the kitchen notice board, and even then I might not remember to look at it until a few days later. I mentioned to Suzy that perhaps I should try to make Sundays different from all my other days, so that I would notice the transition of one week to the next, and she suggested, chortling, that maybe I should go to church. No, thank you; I had enough church-going and kneeling on hard surfaces in my youth to stockpile for life, and it took years after leaving my convent boarding school for my knees to lose their shiny flatness. Later, it was much easier on the knees to tell that it was Sunday again; shops were shut, television was unspeakably awful, and there was always a flurry of activity to get the Lovely Son's uniform ready, shrieking at him about last-chance homework and cleaning his rugby boots, and steeling myself for another frenetic week at work with, yet again, nothing much done in the house. Anyway.... I rang the Pension Service, being unable to find the safe place where I had stored their letter sent far too long ago. My home is filled with mysterious safe places where important things have languished unfound for years. Maybe that's just the same thing as extreme untidiness. Applying took about 15 minutes, and was an eye-opener. A pleasant woman called Susan did her best, although we fell at the first fence of the security questions. These were not the sort of things that are impossible to forget, like your own middle name, or your mother's maiden name, but focused on stuff that was all too easily/possibly deliberately forgotten. On what date had I got married? When had I got divorced? What was the name of the woman who showed you how she knew that your new kitten wasn't a male at all...no, that's not true, it was my Auntie Olwyn... a very useful thing to be taught, too. We got there eventually, and Susan was satisfied that I really was me, and could have my measly pension - let me say here that if this was to be the only pension I would have to live on, it would be spent almost entirely on vets' bills, and I would be in the workhouse within a year. What was startling about the process was how much 'they' knew about me already, including all the answers I couldn't give to the security questions. And to think that we agonise over privacy, and CCTV cameras, and identity cards, and fancy that we have some secrets from the State! But a year was missing from their records. "I'll just go back to 1973" said Susan, deftly manipulating the super-computer that contained the secrets of my life. 1973!! I was a daft young single mother with a 2-year-old then, spending long hours on a frozen beach with an entranced child whose wellies were always full of sea water. The missing year turned out to be 1981, when I was at college; I can remember it very well, as it had been a second year of enormous fun and liberation, and I had a long curly perm and red-hennaed hair. But after college, 25 years of intensely stressful work intervened to create a memory resembling a giant landfill site; full of interesting and occasionally-identifiable things amongst the horrors and the junk, but all jumbled up and indistinct, with bits broken off. The Pension Service will know all about those years, I guess; maybe next time I get confused about things I should remember, I could just ring them and ask. And the pension? Well, in typical Government-issue style, it can't be made too exciting, like a birthday present, so it won't actually be paid when I turn 60, but 4 weeks in arrears, in January 2009. Strange, isn't it - the tax man is getting geared up to take it now, and I won't even get it till next year! I'm not sure I can get too exercised about it in any case. You know I'll only go and spend it, probably at the vet's. My roof, which is about 106 years old and covers my money pit of a house, isn't very well. It was held together by Joe down the road for many years, as he was always in need of beer money, and would keep an eye on all his neighbours' slates, alerting them when something had slipped or was threatening to blow away. As an ex-roofer, he was amazingly agile three storeys up, despite spending most of his days in the pub and a substantial belly, and would charge us just enough for a decent night out later on. Our part in the deal was to stand on the opposite side of the street gazing upwards while Joe explained at length, and in impenetrable Geordie dialect, his upper denture slipping dramatically, exactly what was wrong, what needed to be done, and how his ancient mother's health was. Somehow, updates on his aged mother seemed always to be part of the neighbourhood roofing mission. We trusted Joe, and obeyed, even though we could not always understand what we were being told. But drink and knee problems got the better of him a while ago, and now his agility is limited to toiling breathlessly up and down the street to his local, and our collective roofs have suffered as a result. Other roofers (or imposters) came and went, but the recent wet weather has prompted urgent action as damp and discoloured patches have appeared in several places in my house. Enter Billy. I had watched his impressive work on an ornate leaded porch in the next street, and had asked him to advise on the state of my own roof. I had to stalk him on several occasions before he made the promised call. Within seconds of looking up at the roof, and without needing to be told where the damp patches were, he had pinpointed exactly all the areas needing attention, and diagnosed nail sickness - that sounded serious and unpleasant, worse than a hangnail, really - and missing or holed flashing. He also identified rather accurately where there had been cowboy roofers. Billy looks old enough to be my dad, but he hopped out of my dormer window onto the slates with the nimbleness of a lad of 16, while my stomach clenched with anxiety at the thought of the 3-storey drop to the street below. Then we stood on the opposite side of the street and gazed upwards in time-honoured fashion, while the intricacies of the problem and the solution were explained in detail. Nothing was said about an aged mother, which left me feeling slightly short-changed, but I think I might now be able to sit a roofing theory exam successfully. Final verdict: much work to be done, but thankfully preserving the old slates rather than a complete re-roofing job. Billy promises to make the roof weather-tight before the winter sets in. I must now think of ways to provide Christmas at next to no cost. Next, the boiler's annual service. The boiler isn't quite as elderly as the roof, but it's not in the first flush of youth either. Watch this space. The twins had been conned. The 20-minute task of dragging boxes out of the eaves turned out to be longer and dirtier than anticipated; I hadn't actually gone in there myself, so hadn't seen how much was stored around the corners. But they set to with a will, getting very grimy in the process, and the job got done. The Laurel & Hardy comment was made by their dad, who knows their style all too well, but there was no doubt that they worked hard in thankless conditions for an hour and a half. Boxes and bags were brought down three flights of stairs, and strange, long-forgotten objects were brought to light. The Lovely Son's infant crib, for example, so well wrapped that I had no idea what I would find till I poked a hole in the plastic sheeting. I had no idea that I had kept it; I have been assured so often that grandmotherhood would never be conferred on me that I have become resigned and regard it as the truth. Perhaps. The toys pictured below: was my son a Victorian child or a modern one? Boxes of Lego and Star Wars figures, a turntable, shelving, kitchen items, posters, and much more; we all have stuff like that tucked away somewhere. Hopefully yours is cleaner. Some of it will be cleaned up and repacked, to await instructions; the rest is going, or has gone already, to Oxfam or freecycle, or the rubbish bin. The twins have some pocket money and a large tray of caramel shortcake all to themselves, and I have nice empty spaces for the insulation people to fill next week, and hopefully reduce my criminally-high heating bills in the process. Lego and kettles, stuffed rabbits and bulky old televisions could never do this. Thank you, Laurel & Hardy; you did a great job. Have you noticed how your beloved possessions tend to look shabby or ill-assorted when they are piled up in any way, such as on a removals van, or when they are wrapped in plastic bags? Well, it's worse when they aren't beloved at all, but no longer wanted. This little door halfway up the attic stairs hides horrors. The last of the Lovely Son's stored possessions moulder in what we laughingly call the large eaves. His stuff arrived here years ago, when he lived in Tynemouth, and when he moved South, they were stored here "just for now". Gullible, me? But today the assorted boxes, ancient television, stereo, vacuum cleaner and heaven knows what else, are being dragged out by Sandra's twins (who at 17 must be at least 6 feet tall, so heaven knows how they'll manage in that cramped space) and I get to decide what can be disposed of. The Lovely Son airily delegates this pleasure to me, and I shall be ruthless. Freecycle will come in useful here! It being the Lovely Son's stuff, I am highly unlikely to find money or jewels, although I anticipate spiders in abundance. Thankfully, my own cluttering or hoarding tendencies have never really extended to these areas, although the mirror and the trunk filled with Christmas decorations are mine and will have to be reconsidered. Decorations take up so much space! 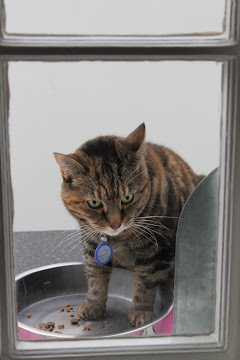 Before I could fill the sink and set out the deodorising dog shampoo, a friend rang to arrange to visit soon, and while we chatted, the doorbell rang. Mad barking from the stinko-dog, (excitable barking of the "Friend! Friend!" type, very loud and irritating; the "Foe! Foe!" bark is interspersed with not-very-frightening growling, and doesn't agitate one's nerves so much) and in came Roger, bringing me two handsome glass jars, Kilner type, but with unusual blue lids, that he thinks may date from the '60s. Before he could even finish saying hello, doorbell again and more mad barking, and in came Suzy, for the cup of tea and scone to which she had been invited earlier. Much excitement from dog, who received a brief and mistaken cuddle from Suzy, until the stench got to her. Rapid return of dog to floor, smelling salts applied to Suzy. 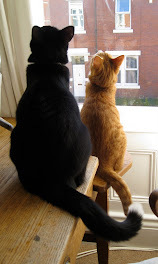 No sooner than I had put the kettle on, doorbell and barking yet again, and in came Charlotte and the Handsome Young Policeman, and we all had tea and a slice of pear and ginger cake (not last week's - a second attempt) and chatted about burglars, as you do when HYPs visit. Trenchant views were expressed (not by me, soppy liberal treehugger, or by the HYP, who is ultra-discreet) about prison being cushy. The dog had ten minutes' respite from all the noisy Friend! Friend! stuff, but as no one would pay any attention to her, smelling as sour as she did, she fretted around their ankles, looking martyred and excluded. There was almost a green cloud around her, with wavy lines emanating from it and the word "PONG". Then doorbell and mad barking again, and in came Sandra. By this time the dog was sounding hoarse and ready to explode, and I had run out of chairs round the kitchen table, which gave me the excuse to stand and ease my painful back. More rude remarks made to the dog, all richly deserved. Some time and distractions later, the dog was bathed. No sooner had I released her from the towel, looking fluffy and cute and fit for human company again, another friend rang to arrange to call in on her way home, and, although she couldn't have foreseen this, to finish the cake and the scones. If I die in the night or am abducted by aliens, I will at least have left a clean dog, if not a tidy house, behind me. 1. America did the right thing yesterday. Fireworks are in order; how useful that tonight is Bonfire Night! So, double celebration whizz bang crackle and flash! Well, possibly. Remember this battered old trunk I acquired through freecycle a while ago? Today, because my back hurts more when I sit down, I have been keeping busy in an upright position. After a long walk through the Dene, and cooking tomorrow's lamb and chickpea curry, accidentally burning the accompanying spinach and potato dish in the process, I thought I'd do something to reduce the to-do list that has been lying heavy on my conscience. Clever idea: start with something easy, and take the vinyl padding off the trunk to see what lies beneath. Step 1 of the Winter Project, tick! So I got busy with the tack lifter tool. Twenty minutes and a self-inflicted injury later, this is as far as I got. There are 3 separate layers to this padding, plus a band of hideously sticky gold plastic tape, and all have been secured very firmly with half a million tacks. After making worthy efforts for a while, I stabbed myself in the thumb with the tack lifter, and retired to clean blood off the sticky grubby wound and to find a plaster. And that's enough Winter Project for today, I think. Now, when did I last have a tetanus shot? Again. Another bout of back pain and attendant misery, with little accomplished and the list of unfinished or not-even-started jobs getting longer and longer. At this rate no one will be getting a Christmas present. But a look at the bathroom scales today confirmed what I knew already: my back would benefit greatly if I were to stop carrying the equivalent of another small person around with me. And could there be a link between the groaning scales and the long-running baking-fest that fills so many of my days? Time for a serious think. Maybe after the election results though.